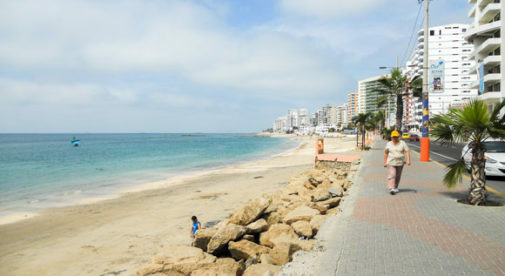 Something really unusual happened in our beach community of Salinas, Ecuador last week. People were posting pictures on Facebook, and it was the topic of conversation in all of the restaurants and bars. What was this noteworthy event? It rained! It actually clouded up and rained—well, a hard drizzle anyway—long enough to make some puddles and wet the streets. Bad weather is really a rare event here on the Santa Elena peninsula. My wife and I purchased a 2,000-square-foot oceanfront condo for $220,000 in 2013, and have lived here full time for over two years now. We could count the number of times it has rained hard enough to notice on one hand. It may be difficult to imagine, but right now as little as $95,000 will buy you a one-bedroom penthouse condo with a rooftop lounge where you can watch the waves. You can also find bigger properties here too. I recently saw a beautiful 4,000-square-foot, four-bedroom home just two blocks from Chipipe beach for $130,000. And what a beautiful beach it is. Let me tell you what it is like to visit the wide, warm beach of Chipipe, just on the other side of the Yacht Club from Salinas Beach. First, as you approach the sand, vendors will wave to you, offering to rent you a 10-foot by 10-foot canopy for the day, along with plastic chairs and tables. At about $8 for the whole day, this is a great deal, since the equatorial sun is not to be trifled with. As you settle in, the local beer man approaches you. He will let you know that whenever you would like a beer or any other cold beverage, just wave or whistle and he will be right there. If you want something healthier than beer or soda, there’s always someone who will open a fresh coconut and put a straw in it for you. Next one or two representatives from local restaurants will stop by to remind you that when you are ready for lunch, just wave them over and they will let you select from the menu. They will call it in by cell phone, and then bring it out to you when it is ready. If lounging on the beach and swimming in the always-warm sea is too sedentary for you, how about a $10 ride on a banana boat? You can rent a jet ski for $20 an hour (less, if it is a slow day and there’s lots of competition between the vendors), or maybe try a little parasailing. You might decide you would like to take a tour by powerboat or sailboat, or join a fishing trip, all leaving several times a day from the new pier in Salinas. As the day winds down, you can consider your dinner options. There are plenty of Ecuadorian comida tipica (local cuisine) restaurants to choose from, as well as places that cater to expats with more familiar dishes. Salinas also has eateries specializing in Peruvian, Colombian, English, or Italian cuisines and more. There’s always my favorite choice—cooking up some fresh shrimp or fish from the local mercado (store) at home, and then enjoying a sunset walk on the malecon (boardwalk), or one last stroll on the beach for the day. Once the sun goes down, if you are looking for nightlife, Salinas has several local clubs for Latin dance music, as well as expat hangouts with American music and karaoke nights. In addition to that, there are often special parties or celebrations to choose from. And of course, there is always the movie theater in the nearby El Paseo Mall. The fun can last long into the night in Salinas, as people enjoy the night breezes with temperatures still in the mid-70s F.
If a quiet night at home watching TV is more your style, in Salinas you can choose from cable TV or different satellite dish companies. The peninsula also has several internet providers, some with fiber optic lines available, so streaming content from the U.S. or the rest of the world is possible as well. Then, one of my favorite times of the day, lying in bed listening to the sounds of the surf in the background as you fall asleep, knowing that it has not been a dream…and when you wake up, you will still be living your affordable summer lifestyle.